When leading legal tech firm, Ari Kaplan Advisors, interviewed 30 General Counsels from Fortune 1000 companies about current usage and future trends for contract AI, they discovered that 37 percent of the companies were already using AI for contract review and analysis and 58 percent confirmed that they intended to use it this year. 50 percent of the respondents also said that they were prepared to increase their contract AI spend in 2019. Those that had used contract AI were optimistic about the momentum that it was gaining within their organization. This was evident from 64 percent of the respondents rating their previous use of AI poorly (one or two on a scale of one to five) while having high expectations for the future of contract AI within their organization (mostly four or five on a scale of one to five). Contract AI – What Does It Improve? The respondents noted that using AI helped them understand historical behaviors, remove points of contention, and arrive at a clear and unhindered negotiation process. AI knows what clauses and provisions are relevant for different types of contracts which precipitates a unified drafting approach, without the need for a lawyer to go back and forth over a contract. AI helps compare different agreements, and analyzes gaps between them. It studies different clauses and prepares agreements for future use. As one respondent said, “AI helps move people up the value chain.” It removes monotonous and manual work, and empowers in-house attorneys to focus on more pressing and core issues. Contract AI – How Do You Get Started? 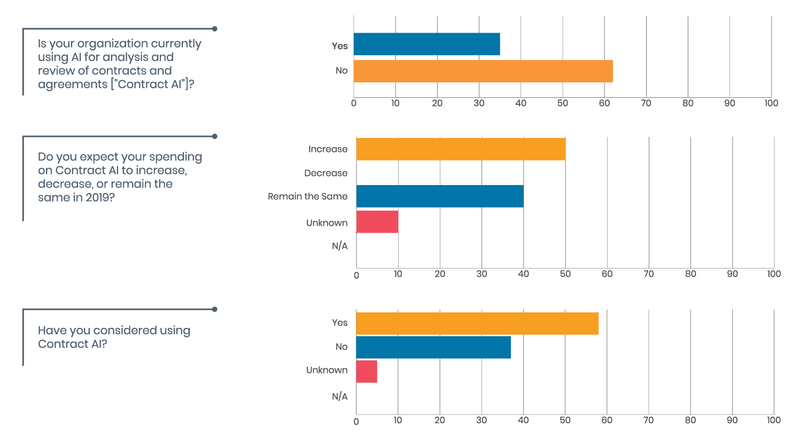 What a majority of respondents found most intimidating was convincing company management about the validity of contract AI. On average, it took nearly three months to procure approval for a pilot – that is if they got it at all. So what do the respondents recommend? The respondents suggest that you describe and quantify the value of your results. Define success metrics and identify the ROI. Some were successful with getting approval by stressing on how contract AI reduces regulatory risk. Persuading other business units to include the budget for contract AI within their budgets is another way to go about it. The legal departments at many of the companies weren’t solely capable of financing contract AI, so they encouraged their business units to make this investment as part of a larger investigation or M&A transaction. One of the correspondents suggested not limiting the pilot group to solely attorneys. Having an inter-disciplinary group helps integrate contract AI into all of the company’s infrastructure. Choose a pressing case and apply AI to deliver and demonstrate results to your management. Results are more persuasive than processes. Although contract AI is predicted to be of use in countless departments within an organization in 2019, nearly 89 percent of the respondents were enthusiastic about using it for procurement and compliance. With executive support for contract AI being strong and awareness of its potential being recognized across organizational verticals, it’s no surprise that 2019 appears to be the year that contract AI finally becomes a staple in corporate legal departments. At LegalEase, we are constantly aware of automation advances and strive to utilize third-party tools to develop technology-abled solutions for our clients. We use proprietary CORE research and activity automation engines to reduce human involvement and error, thereby streamlining processes and ensuring our clients the fastest, most accurate results. We work with leading contract management technology that enables our clients complete control over their contract universe, reduces susceptibility to risks and penalties, optimizes spend, and improves inter-departmental decision making. If you’d like to optimize your legal functions, feel free to reach out to us at contact@legaleasesolutions.com. Our team of expert attorneys is happy to help.